If you have acne-prone skin, it’s vital that you avoid products that contain comedogenic ingredients. Comedogenic ingredients clog pores, it’s as simple and as complex as that! Skin oil, known as sebum, is produced by the sebaceous glands to keep our skin moist, but it also can get mixed with a number of “skin debris” such as dead skin cells, make-up, dirt and different ingredients of skincare products. When skin oil is produced in excess, the mix of sebum, dead skin cells and all other “ingredients” become too much to be naturally disposed by the pores and they get clogged. When a pore becomes clogged, the sebaceous glands still produce oil but there is no way to remove the excess oil and dead skin cells. This can happen by internal buildup and/or be exasperated by external factors such as makeup or skincare products. There are specific ingredients that are more likely to clog pores and these are labeled as comedogenic. It is especially important for someone with acne-prone skin to avoid these ingredients. The U.S. Food and Drug Administration (FDA) defines a comedogenic ingredient as one that is known to clog pores. However, the FDA does not define a list of ingredients that are considered “non-comedogenic.” Therefore, it is possible that some companies can claim that their product is non-comedogenic while in fact it is not, and it still falls within the acceptable guidelines of the FDA. There are no clear and standardized guidelines or testing within the industry. Some products may be labeled as “non-comedogenic”, or even “dermatologist approved” and “oil free” regardless of the ingredients or lack of testing. So – it is up to you to become an educated consumer and read the label before you make a purchase. Just one ingredient that is comedogenic can throw your skin further off balance and cause an acne outbreak to be more severe. It is extremely important to keep the pores free of clogs to prevent acne and the best way to do that is to follow a good daily skin care regimen. These methods are in addition to our usual daily skin care regimen for acne-prone skin. Steaming the face is an inexpensive and highly effective remedy for clogged pores. This should be done 1 to 2 times per week. Avoid splashing the hot water (which can burn your skin). Then pat your face dry and use a toner (to balance the skin’s pH) and mild moisturizer (to protect your skin from drying out). Peel, cut and remove seeds from the cucumber. Puree it in a blender. Strain the mixture to collect the juice, and add the lemon juice from half the lemon. Use organic vegetables when possible. Dip a cotton ball or cotton pad into this cucumber tonic and pat on your skin. Allow to air dry. Even though over-the-counter products can assist us in our journey to get clear skin, remember, the only way to fully treat acne is to end the cycle of acne. Taking action from within is the best step you can take. Most of you are already doing that with AcnEase®, and if you haven’t tried it, today is a great day to start! 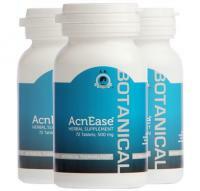 As a botanical ingredient based acne treatment, AcnEase® is designed to treat acne from the inside out by limiting your body’s response to hormones in the blood and keeping your production of skin oils at a healthy level that is beneficial for your skin. AcnEase® can be used by anyone, men or women, adults or teens, women taking oral contraceptives, trying to get pregnant, or breastfeeding mothers. It’s free of sugar, gluten, nuts and milk derivatives and doesn’t contain any chemicals, GMO’s or phytoestrogens. Don’t take our word for it...read the ingredient list and see for yourself. Keep these lists of what to avoid and what to use handy when you’re out and about looking for skincare products. Tell us in the comments below how you avoided the marketing hype and created a non-comedogenic skincare routine.